Remodeling a bathroom comes right behind a kitchen with home projects that pay off, but it can be expensive to get a look that isn’t builder boring. One of the most expensive purchases when remodeling either of those rooms can be the cabinetry. 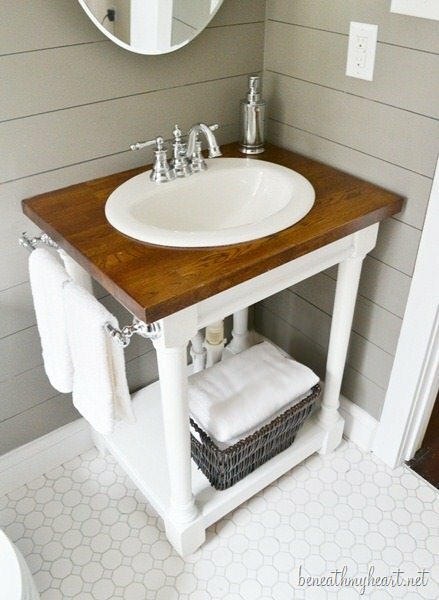 Lucky for us, if a bathroom redo is in your future, you can save some serious cash and make your bathroom look high end custom with these DIY bathroom vanities! Easier than they look and much more charming that a vanity from some big box store, these are one of a kind projects. 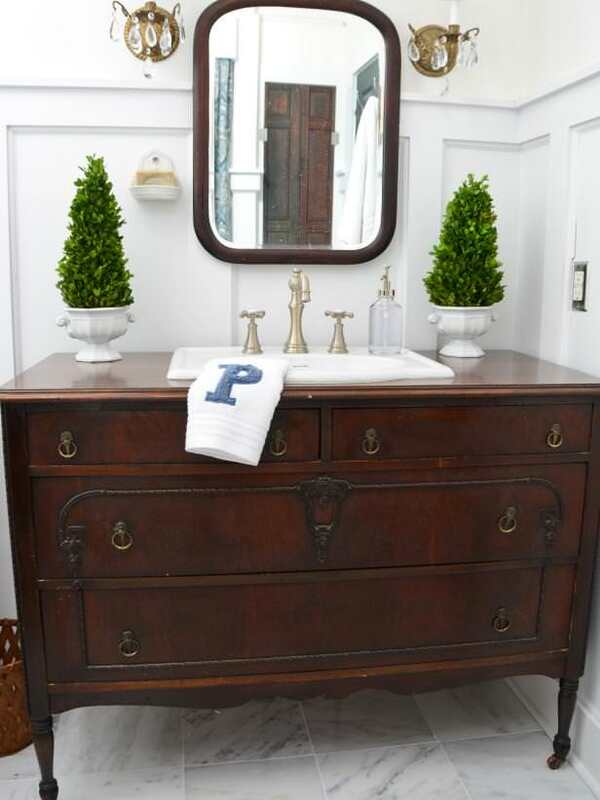 Turn a vintage dresser into a bathroom vanity with this tutorial from ‘HGTV’. Make sure you choose a sturdy piece, and obviously one you don’t mind cutting into the top for the sink. We like the square sink with this antique piece! 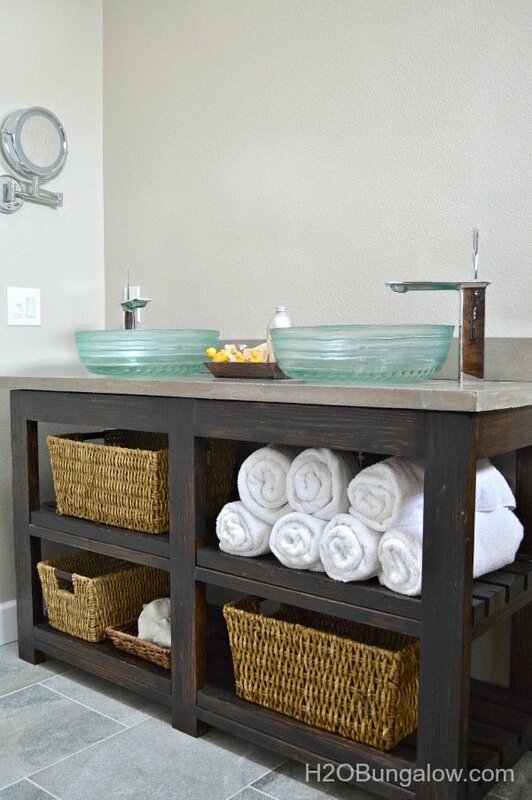 This DIY open shelf vanity from ‘H2O Bungalow’ was made for less than $100! You couldn’t touch a cheap box store cabinet for that. Great tutorial with photos for each step. Learn how to build a butcher block vanity from ‘Beneath My Heart’. LOTS of photos in this step by step tutorial. This would be the perfect size for a powder room! 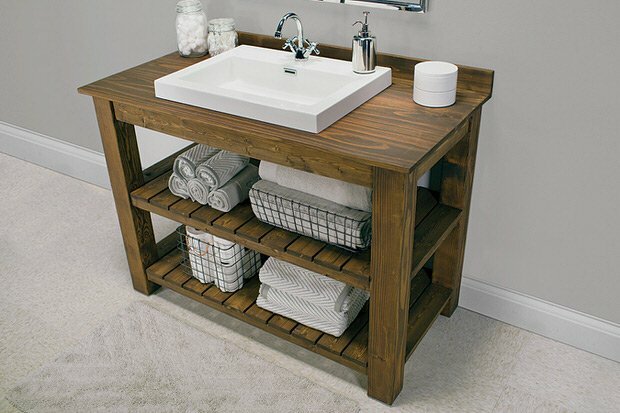 Below is a DIY rustic vanity from ‘Build Something’. Perfect for the modern farmhouse trend, can you picture this with white subway tile? 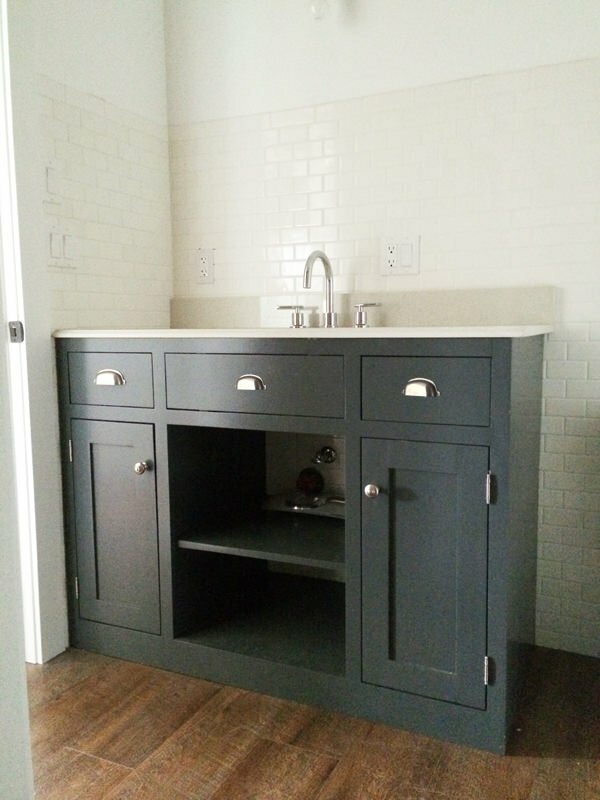 From one of our favorite woodworkers ‘Ana White’ comes these free plans and instructions for this simple gray bath vanity. She even tells you what kind of hinges to get for the doors! 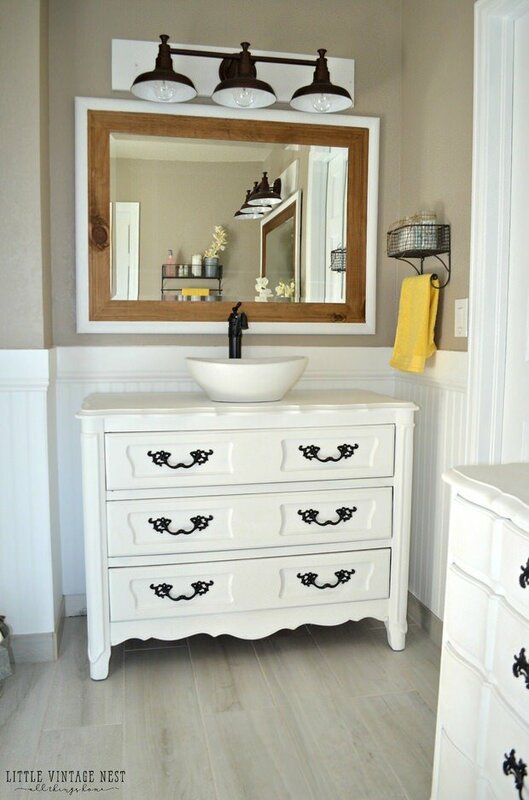 Here is another tutorial on how to turn an old dresser into a bathroom vanity from ‘Little Vintage Nest’. This one has a vessel sink, which saves room insider the dresser for storage. Love that! 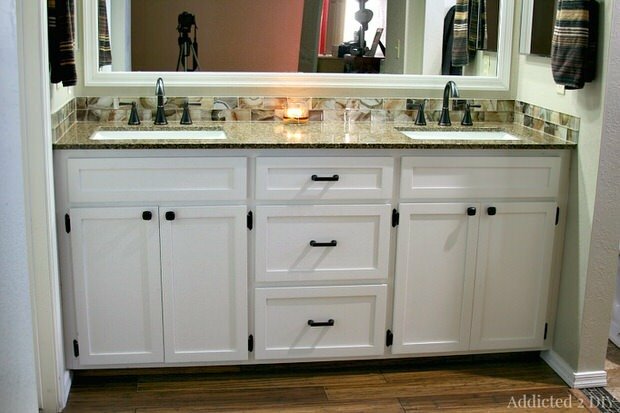 From ‘Addicted 2 DIY’, this DIY double bathroom vanity isn’t freestanding like the others, but is all DIY! Made to replace an old one that fell apart, this tutorial has tons of step by step photos. 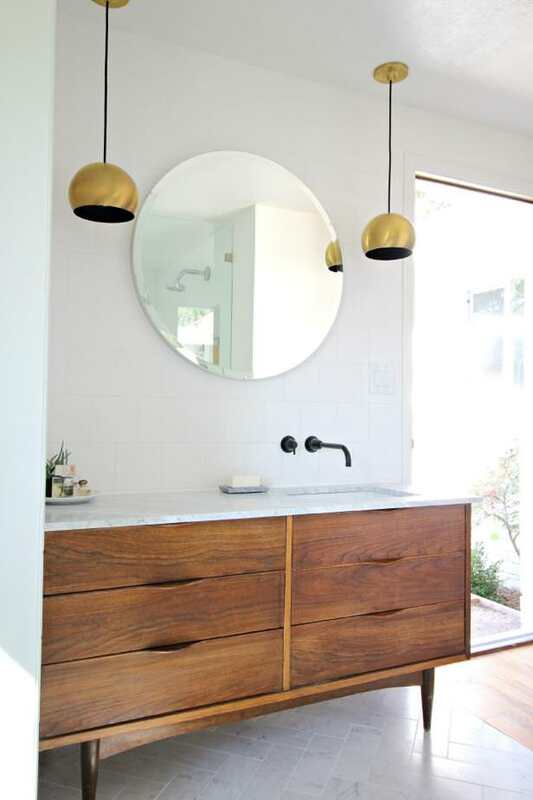 From ‘DIY Network’, this mid-century bathroom vanity was a DIY project, though unfortunately, there is no tutorial! Which is no big deal, since by now you’ve read enough of these tutorials to have this down, right? This is the same project as the dresser ones above, just with a different style of furniture. My daughter and son in law inherited this exact dresser from his Grandmother! Love! 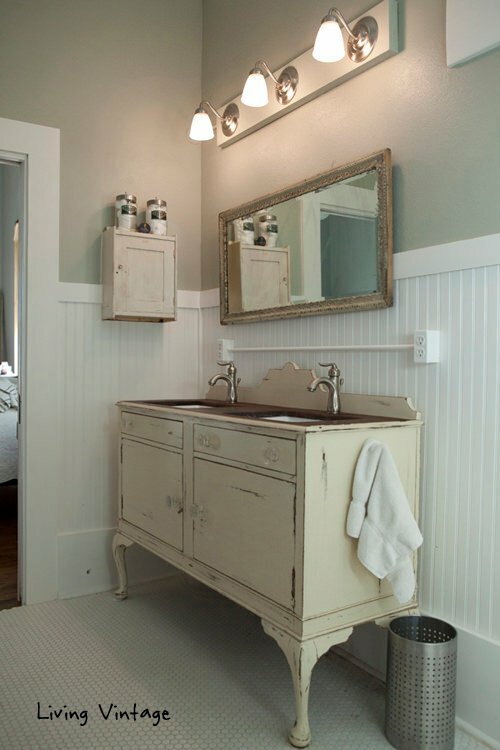 Last, from ‘Living Vintage’ is another example of a vintage dresser as a bathroom vanity. This one was large enough for two sinks! The post Creative DIY Bathroom Vanity Projects appeared first on The Budget Decorator.